Whether you're following a favourite pastime or trying out a new one, you'll find a wealth of opportunity to enjoy an active break in Captain Cook Country. Watersports enthusiasts will head for the Hartlepool Marina, Stockton's Riverside or Scaling Reservoir where there are opportunities for sailing. Canoeing at the Tees Barrage can be fun, but why not try white-water rafting? Surfing at Saltburn can be exhilarating too. 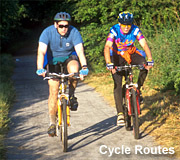 Motorsports enthusiasts can try their hand at rallying and off-road driving as well as karting, whilst horse riding and cycling on the woodland tracks away from the busy roads is a great way to relax. For golfers there are four splendid coastal courses to choose from, and there are fresh water and sea fishing opportunities galore! For birdwatching enthusiasts, the seacliffs all along the coast from Saltburn to Robin Hood's Bay are home to many native and migrant seabirds, whilst the forests and moors offer further opportunities for 'twitchers'. If you prefer to be a spectator then check out the Redcar racecourse or Premier League football fixtures at Middlesbrough's Riverside Stadium. Culture 'vultures' can get their fill at the many museums and galleries showcasing local history and crafts. Trace the making of Middlesbrough at the Dorman Museum and see the unique 225 feet high Transporter Bridge across the River Tees. Look out too for the 30ft high 'Bottle of Notes' sculpture made with text from Cook's journals. Nature's World, an innovative 25acre environmental centre, goes underground with a giant 'Hydroponicum'. Close by is stately Ormesby Hall, a magnificent Palladian mansion built around 1742. Owned by the National Trust, the Hall stages a range of outdoor events. Seven-day shopping is offered in Middlesbrough's three major centres, boasting more floorspace than the nearby Metro Centre. 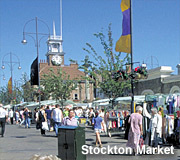 Stockton's broad pedestrianised High Street hosts a lively twice weekly market. But browse through the many other colourful open air markets in the area also, and search for a bargain in the many antique shops and craft outlets. With the New Orleans style Captain Cook Square, and Stockton's new Wellington Square Centre providing even more choice, you really can 'shop 'till you drop'. Time to relax even further. For a real taste of the North, spend a lunchtime or evening in one of the many town or country pubs. The atmosphere and the ales are renowned! Most also serve meals and snacks, with menus featuring local produce and, of course, fresh seafood. Visit micro-breweries at Pinchinthorpe and Stokesley, then sample the output for yourself with a meal or selection of great local cheeses. Holiday evenings come alive in a restaurant or bistro serving that extra special meal to relax you after your day of activity. You'll find the town centres offer enough pubs, clubs and speciality eating to satisfy most night-owls.